If you’ve got limited drive space or a slow internet connection, you might want to limit what things Outlook downloads. We’ve shown you how to control the items that Outlook downloads based on the ages of the items, but that’s not very flexible. It also only works on emails in your mailbox (and, for Outlook 2016 and later, delegate mailboxes), so if you’ve got access to public or shared folders, or you’ve got a lot of calendar events and tasks, you need another option. 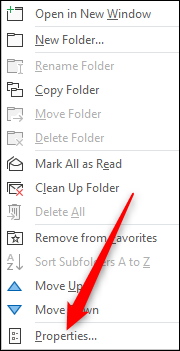 Step forward folder synchronization, which lets you filter the things Outlook downloads on a folder-by-folder basis. Note: Folder synchronization works with all supported versions of the Outlook client when you are connected to a Microsoft Exchange Server, including Hotmail or Outlook.com. If you connect to another service, like Gmail or a personal mail server, you can configure these options but Outlook may ignore them. You can access the synchronization options for a folder by clicking Folder > Folder Properties. You can also right-click the folder in the Navigation pane and then click the “Properties” command. On the folder’s properties window, switch to the “Synchronization” tab.